The gospel of John relays the story of Lazarus’ resurrection by Jesus from the dead. Most people have heard this story, at least in part. What always fascinates me about the story of Lazarus is the discussion between Jesus and Martha. at if he arrived sooner, he could have saved Lazarus. 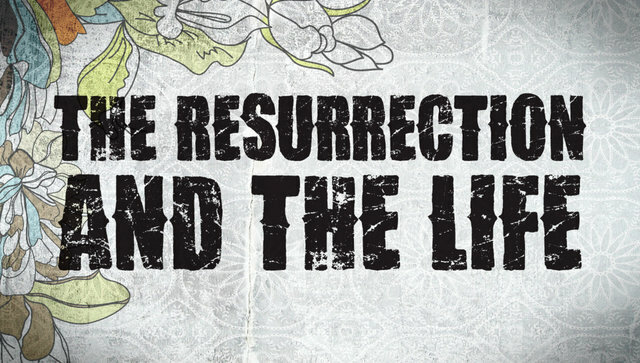 Jesus replies that Lazarus will rise. And Martha, instantly thinking to the future, agrees with Jesus that Lazarus will rise in the final resurrection on the last day. And then Jesus makes his famous statement, “I am the resurrection and the life. The one who believes in me will live, even though they die.” Jesus concludes by asking Martha if she believes him. Have you ever wondered why as Christians we are always so drawn to the future fulfillment of God’s promise of life? For most, eternal life is an entirely future proposition. The result is all too often, a mundane existence until then. Perhaps, there is something in this story for us besides the miracle of Lazarus emerging from the tomb. Maybe a (if not the) central point is that Jesus comes to bring life NOW and in the future. The take away from the story of Lazarus is not just the miraculous power of God, but the restoration of life through Jesus that is available now. Martha instantly looked to the future and Jesus redirected her to the now. How would you describe your life? Monotonous, mundane, dry, difficult…a grind? Jesus comes to offer life now. Eternal life for certain. But life now! And how could it be eternal if it had a starting point sometime in the future anyway? What I am suggesting is not an erasing force of all life’s difficulties, trying circumstances, disappointments or stresses. The fact is we live in a broken world and we too are broken people. However, what Jesus brings to those who receive it is a total reorientation to this world. It is no longer a definer of us – He is. It is no longer our home – He is preparing us one. It is no longer an uncontrolled power over us – He broke that. While the fullness of life is not a total possibility until the “someday,” the life that Jesus brings now offers us hope. It grants us peace. It fills us with joy. And it is restoring us. Reminding us that we are new creation – the old has passed, the new is here. Who doesn’t want that? And yet we seem to always look to the future. Jesus said, “I am the resurrection and the life.” And the he asked Martha the same question he asks us. Do you believe me?